Otago 5-144 (Brendon McCullum 67*, Hamish Rutherford 27, Dale Steyn 2-13) beat Sunrisers Hyderabad 5-143 (Jean-Paul Duminy 57, Darren Sammy 26, Nathan McCullum 2-23, Nick Beard 2-31) by five wickets. Sunrisers Hyderabad managed 143 for the loss of five wickets in the stipulated 20 overs whereas Otago piled up 144 with five wickets still in hand and 22 balls still available. Nathan McCullum (Otago) was declared ‘Player of the match’ for his excellent bowling while removing the top order batsmen of the rival team. The sixth qualifying match was played on Friday, September 20, 2013, at Punjab Cricket Association Stadium, Mohali, Chandigarh. Earlier, Brendon McCullum won the toss for Otago Volts and made up his mind to chase the target. The skipper of Sunrisers Hyderabad, Shikhar Dhawan, along with Parthiv Patel got off to a flyer by scoring 20 runs in 2.5 overs. The latter was clean bowled by Nathan McCullum for 12 and Dhawan became the next victim after the addition of five runs to the total for 12 as well. The top order batsmen were shaky and the third wicket was lost at 45 in 7.4 overs as Jean-Paul Duminy and Cameron White got together at the crease. White hit the second six of the innings in the 12th over and Duminy got his 4th four in the same one. The fourth wicket partnership was broken at 85 when the first was caught by Brendon McCullum at extra cover off Neil Wagner for 25. Darren Sammy walked in next and was dropped at one whereas Duminy kept on cruising at the other end. Sammy dispatched two sixes in the 17th over as Jean-Paul Duminy reached his 22nd Twenty20 fifty in the final over and remained unbeaten for 57 off just 38 deliveries with 7 fours. Darren Sammy surrendered for 26 off 22 with 2 sixes and 1 four while Sunrisers Hyderabad scored 143 for the loss of five wickets in 20 overs. 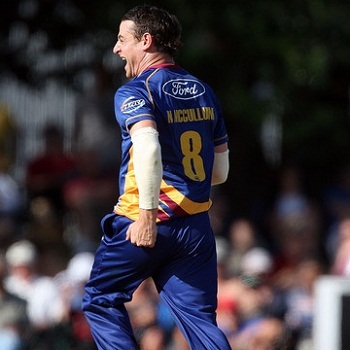 Nathan McCullum and Nick Beard were the most successful bowlers with two wickets each whereas Neil Wagner got one. Neil Broom along with Hamish Rutherford went into chase in a typical T20 style as the first hit 1 six and 2 fours in two overs. Broom was caught behind by Patel off Dale Steyn at 27 after scoring 16 runs and was replaced by Brendon McCullum who opened his account with a six. Rutherford hit two consecutive fours in the 4th over and added another 2 boundaries in the coming overs. 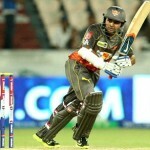 McCullum accumulated 12 runs in the 8th over and the pair took the score to 80 in 9.4 overs. Rutherford was sent back to the pavilion at that point for 27 and Ryan ten Doeschate scored just three runs. Otago was 3-85 in 10.5 overs as James Neesham joined in with Mccullum and the first preferred to attack while sending the ball flying over the rope twice. Brendon McCullum punished Ishant Sharma for 22 runs in the 15th over comprising 2 lofty sixes and even fours. He powered his 24th Twenty20 half century in the same over and Neesham was caught by Dhawan off Sammy for 21 as the score touched 136. Brendon Mccullum stood firm at his end for 67 off 39 mere deliveries with 5 towering sixes and even fours as Otago achieved the target by hammering 5-144 in 16.2 overs. Dale Steyn was the top wicket taker with two whereas Darren Sammy and Amit Mishra shared one wicket each. 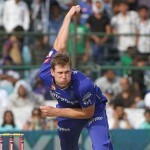 Otago Volts triumphed vs. Sunrisers Hyderabad with a big Margin of five wickets. That was the third consecutive victory for the visitors whereas both teams have qualified for the main event.